Traffic deaths dropped by 27 in 2015 to 230, a reduction of over 10 percent from 2014. Pedestrian deaths decreased only slightly. Bicyclists fared better: deaths dropped by 30 percent. "Even though such deaths declined, city officials and traffic-safety groups agreed that more aggressive steps must be taken to reach Mayor Bill de Blasio’s goal of eliminating traffic deaths in the city by 2024, as part of a plan called Vision Zero that he announced nearly two years ago," writes Emma G. Fitzsimmons of The New York Times. "Pedestrian deaths, which account for the largest share of the fatalities, dropped slightly last year after reaching a historic low in 2014," adds Fitzsimmons. The 133 recorded fatalities amounts to 58 percent of total traffic deaths. 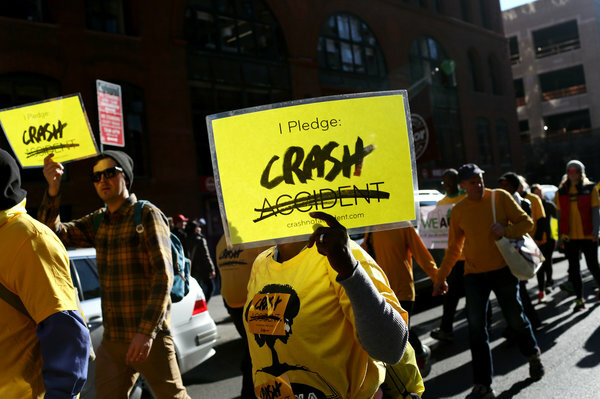 The Vision Zero program enters its third year with the strong backing of Mayor Bill de Blasio. A few bullet points on how the program, which featured various safety improvements, such as "lowering the default speed limit to 25 miles per hour" (See NYC Vision Zero Action Plan for more details), fared in 2015. Traffic deaths are down in every borough with one notable exception: Staten Island. Bicycle fatalities dropped by 30 percent, from 20 to 14. Motorcyclists saw the greatest improvement: deaths reduced by over 40 percent, from 37 to 22. No change for those riding in motor vehicles: 61 deaths.